2. Using the Dispa-SET API. This short tutorial describes the main steps to get a practical example of Dispa-SET running. Dispa-SET is primarily designed to run with GAMS and therefore requires GAMS to be installed with a valid user licence. Currently, only the 64-bit version of GAMS is supported in Dispa-SET! The api requires the path to the gams installation folder. The “get_gams_path()” function of dispa-set performs a system search to automatically detect this path. It case it is not successful, the user is prompted for the proper installation path. The PYOMO version of Dispa-SET is currently outdated. The changes implemented in Dispa-SET version 2.2 and 2.3 will not work in the Pyomo solver. It is recommended using the GAMS solver to benefit from the latest improvements of the model. Install a solver and add it to the PATH environment variable (e.g. if cplex is installed, the “cplex” command should be callable from any command prompt). Dispa-SET can be run from the command line. To that aim, open a terminal window and change de directory to the Dispa-SET root folder. 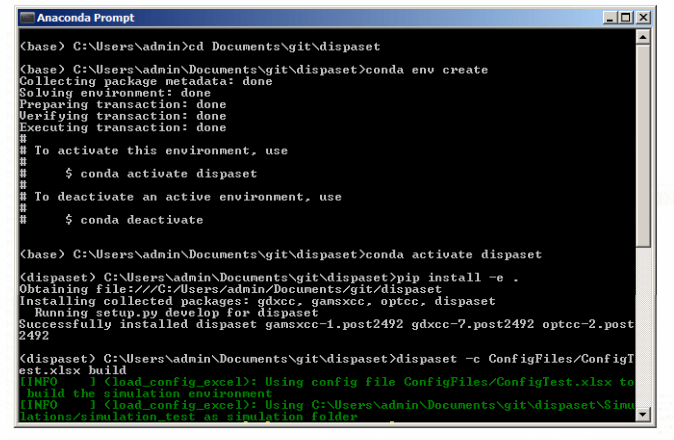 Dispa-SET runs are defined in dedicated excel configuration files stored in the “ConfigFiles” folder. The configuration file “ConfigTest.xlsx” is provided for testing purposes. It generates a 10-days optimisation using data relative a fictitious power system composed of two zones Z1 and Z2. The simulation environment folder is defined in the configuration file. In the test example it is set to “Simulations/simulation_test”. The simulation inputs are written in three different formats: excel (34 excel files), Python (Inputs.p) and GAMS (Inputs.gdx). The steps to run a model can be also performed directly in python, by importing the Dispa-SET library. An example file (“build_and_run.py”) is available in the “scripts/” folder. A more detailed description of the Dispa-SET functions in available in the API section. It is sometimes useful to run the dispa-SET directly in GAMS (e.g. for debugging purposes). In that case, the pre-processing must be run first (steps 1.2 or 2.1, 2.2 and 2.3) and the gams file generated in the simulation folder can be used to run the optimization. Run the model in GAMS. The result file is written in the gdx format and stored in the Simulation folder, together with all input files. GAMS can also be run from the command line (this is the only option for the Linux version). Various functions and tools are provided within the PostProcessing.py file to load, analyse and plot the siimulation results. The use of these functions is illustrated into the the “Read_results_notebook.ipynb” Notebook or in the “read_results.py” script, which can be run by changing the path to the simulation folder. The type of results provided by the post-processing is illustrated hereunder. The power dispatch can be plotted for each simulated zone. 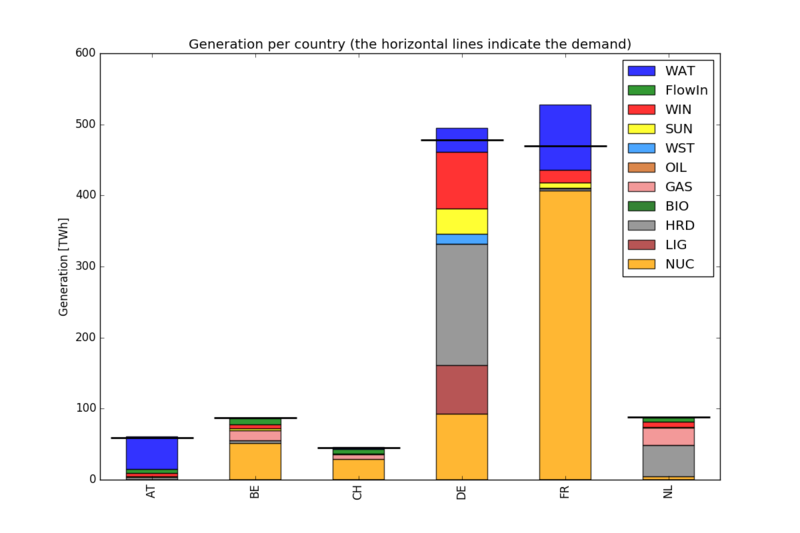 In this plot, the units are aggregated by fuel type. The power consumed by storage units and the exportations are indicated as negative values. It is also interesting to display the results at the unit level to gain deeper insights regarding the dispatch. 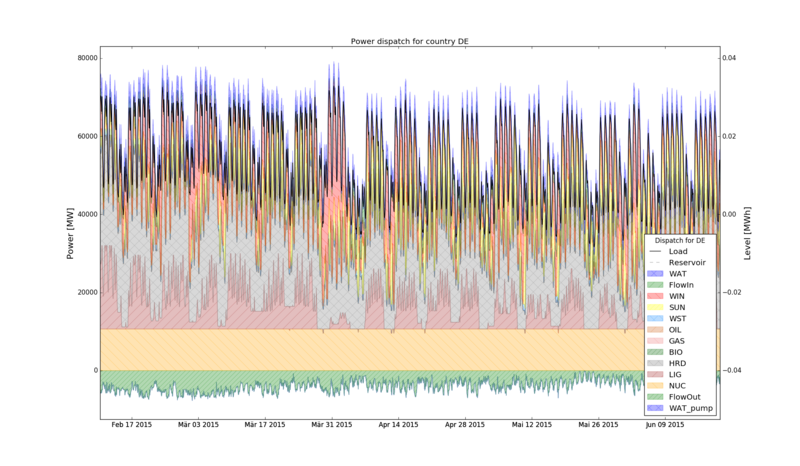 In that case, a plot is generated, showing the commitment status of all units in a zone at each timestep. Both the dispatch plot and the commitment plot can be called using the CountryPlots function. 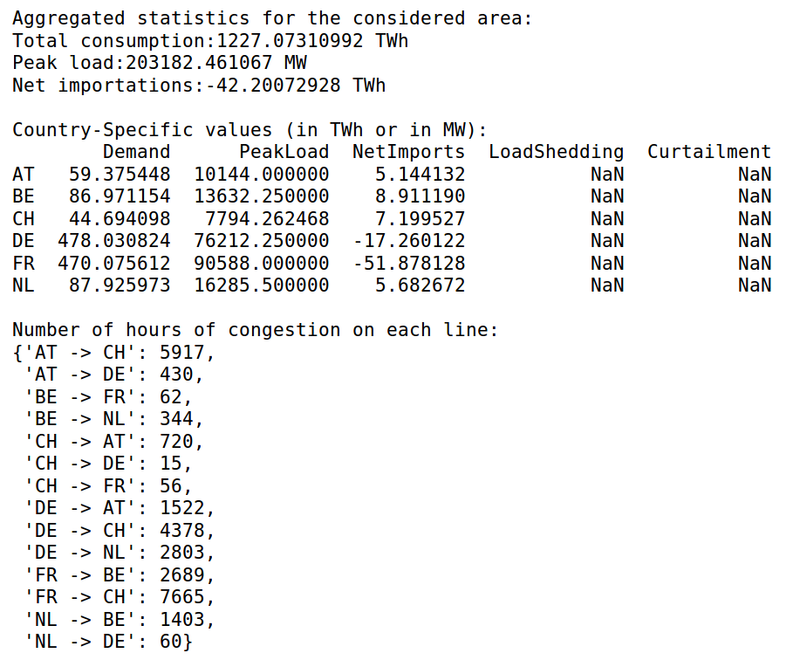 Some aggregated statistics on the simulations results can also be obtained, including the number of hours of congestion in each interconnection line, the yearly energy balances for each zone, the amount of lost load, etc.